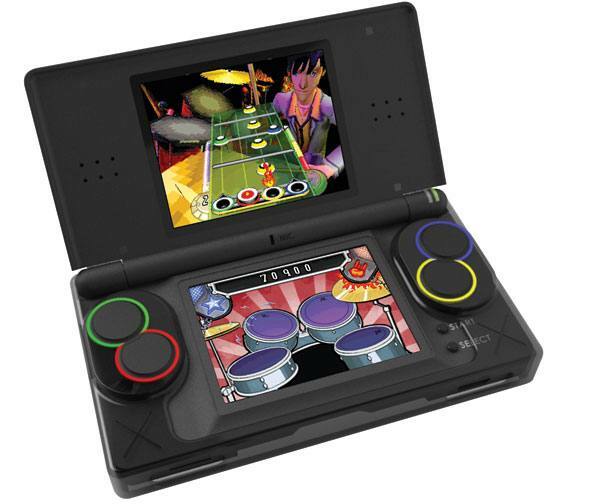 Co-Optimus - News - Band Hero Goes Portable on the DS, Includes "Drum Grip"
Band Hero Goes Portable on the DS, Includes "Drum Grip"
It's like deja vu all over again. Band Hero has been announced for the Nintendo DS via press release. Wait a minute, you say. The DS has a microphone built in, and the Guitar Grip has been out for a while now. How are folks supposed to play the drums? There's a miniaturized and likely finger cramping attachment coming that will allow just that. The aptly named Drum Grip (which you don't really... you know, grip) will let you pretend to play the larger pretend drums you have back home, while you're on the go! You have to give them credit for trying, but it appears that this is just a skin/glove holding some fancy button toppers. I wonder if the drums will be playable without the grip? According to the release, 30 songs by "today's top artists" will be available. One has to wonder if they will be able to squeeze vocals, bass, guitar, and drums for thirty songs all onto one cartridge. Let's hope so, or the portable Band Hero won't really be very portable. Revolutionizing the music videogame genre once again, Guitar Hero and Activision are expanding the boundaries of music gaming with the introduction of full band play in Band Hero™ for Nintendo DS™ Lite. Band Hero delivers an explosive and unprecedented social gameplay experience for Nintendo DS Lite with the addition of vocals and drums – via an innovative new Drum Grip™ – to the guitar and bass gameplay popularized by the Guitar Hero® On Tour trilogy. Band Hero allows handheld gamers to choose the way they want to play in multiplayer mode with any instrument combination of guitar, bass, drums and vocals as they strum, drum and belt out some of today’s most popular tracks across multiple genres of music, including rock, pop, alternative and punk. With the largest and most diverse set list in a Nintendo DS Lite offering to-date, Band Hero offers fans 30 master recordings from today’s top artists including: Blink-182, Avril Lavigne, The Killers, KT Tunstall, and Fall Out Boy. With new features players can enjoy anytime, anywhere, a brand new Rockstar Editor to fully customize your band members, No Fail mode and Stage Stunts,Band Hero changes the way games can be played on the road. Page created in 0.6364 seconds.